‘We are like sailors who on the open sea must reconstruct their ship but are never able to start afresh from the bottom. Where a beam is taken away a new one must at once be put there, and for this the rest of the ship is used as support. In this way, by using the old beams and driftwood the ship can be shaped entirely anew, but only by gradual reconstruction’ (Neurath & Cohen, 1973, p. 199). A research is by no means entirely new judged from every aspect but gradually built upon old knowledge. 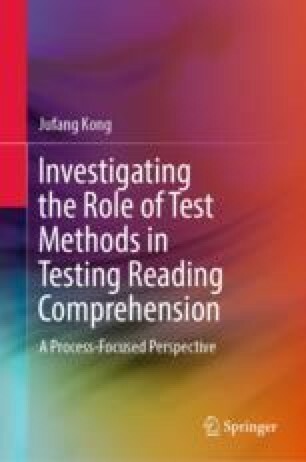 The following four chapters serve as a review of the important concepts of reading comprehension, validity, test method and mixed research methods in literature. This chapter mainly discusses the key theories of reading comprehension. After several influential theories and models of reading comprehension are outlined, the chapter examines the factors affecting reading comprehension process, namely, reader, text and the interaction between reader and text. The chapter ends with Khalifa and Weir’s model of reading comprehension based on which the current empirical study was carried out and the summary of this chapter.